When I was at PECI, I presented several papers at ICEBO. They are a bit dated in that context since I have been with FDE for about 12 years now. But since the papers were basically about applied physics in building systems, the content is still relevant and I often reference them in class. So, I thought I would post them here to make them more readily accessible. This is a paper I wrote to see if I could get an award for having the longest, most complex title of all of the papers submitted for the conference that year. The contest was eventually canceled because the judges fell asleep while reading the title of this paper. Monitoring on-going performance and persistence of savings for improvements we made in existing buildings were we were doing a process called "operating the building properly". 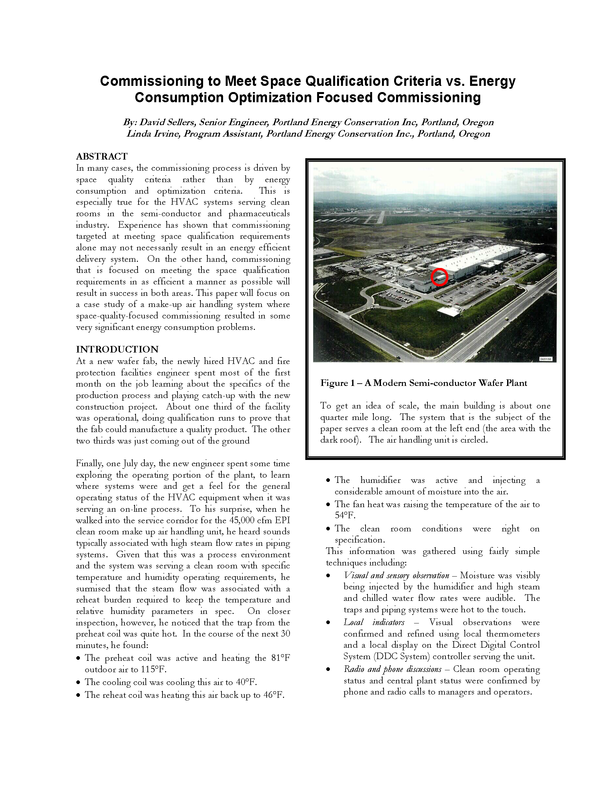 This process was a fore-running to something we now call ongoing commissioning. As the baseline for computer modeling of energy consumption. We would "tweak" our model until the output generated a profile that was, on average, similar to the actual average daily energy consumption pattern for the building or system we were working with and when we got there, we considered the model to be good. Back then, the model was a bin data based model developed initially by Jack Vorbeck and then by Al Black, both of whom worked for McClure Engineering in St. Louis, where I started my career. Al was one of my mentors and is the reason I am in this industry truth be told. ​In any case, you set up the model run by filling out input forms and then transcribing the data to a punched paper tape that uploaded through a teletype machine to a mainframe computer in Kansas City (it was located there because that is where everything was up-to-date). The data was then loaded into the software which ran in a remote batch process overnight. The morning after, you would go by the local office main-frame office and pick up your output, which was in the form of a stack of 11x17 paper from a sprocket driven line printer and hope that when you plotted it against the average daily consumption baseline, it matched. Otherwise, you would need to "tweak" your inputs and run it again, with no way to get an answer sooner than the following morning. We have come a long way. 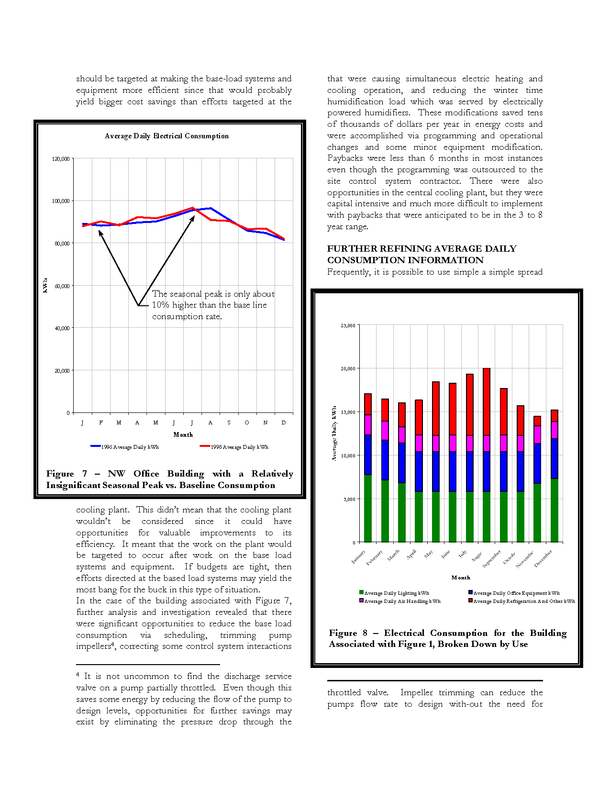 Having said all of that the average daily consumption analysis technique has served me well through my entire career; I still use it today as a part of my initial scoping effort to help me understand what might be going on in an existing building. And Bill Koran made the job easier from the slide rule/calculator/graph paper based approach we used when I first learned the technique by developing the Utility Consumption Analysis tool (UCAT). Bill subsequently developed the Energy Charting and Metrics Tool (ECAM), which leave's UCAT so far behind in the dust that it is not funny (especially if you are an older person finding your self in the dust cloud of advancing technology). But for a quick look, I still find UCAT to be handy and something I can teach a new-comer to do pretty quickly. This is another paper I wrote for ICEBO in my effort to secure the longest, most complex title award and it is how I got to know David St. Claire, who was kind enough to peer review it for me. I already have it up on the PID Resources page of the site so you can go download it from there if you are interested in the topic. This was my final entry the longest, most complex title award contest. In the paper I try to take a holistic look at one of the systems I worked on when I was a Facilities Engineer at Komatsu Silicon America's Hillsboro, Oregon facility (now Solar World). The system was delivering ideal production conditions because it had been commissioned with that goal as the focus. But the commissioning process had left the system accomplishing that goal in a way that was significantly less efficient than it could have been. In the paper, I discuss the clues that pointed out the issues to me in less than an hour, the steps the team that I worked with at the time took to correct the problem, and why the problem occurred in the first place.